The Wonder Wagon was our first large collaborative project that marked out whole new territory for our families identity in our city. We had only two years earlier returned from our year in Brooklyn NY which proved to be a great learning opportunity for our family. Building the Wonder Wagon for the first ArtPrize in Grand Rapids MI was a chance to see what our family could accomplish when we worked together with other professional artists. Those artists were Cameron and Rachael VanDyke, a husband and wife artist team who brought a higher level of disciplined rigor and organizational skill that we desperately needed to take on a large and expensive public art project. Building the Wonder Wagon was proceeded by a long process of meeting once a week over dinner and hatching the plan. We talked about ideas. We brought in other people. 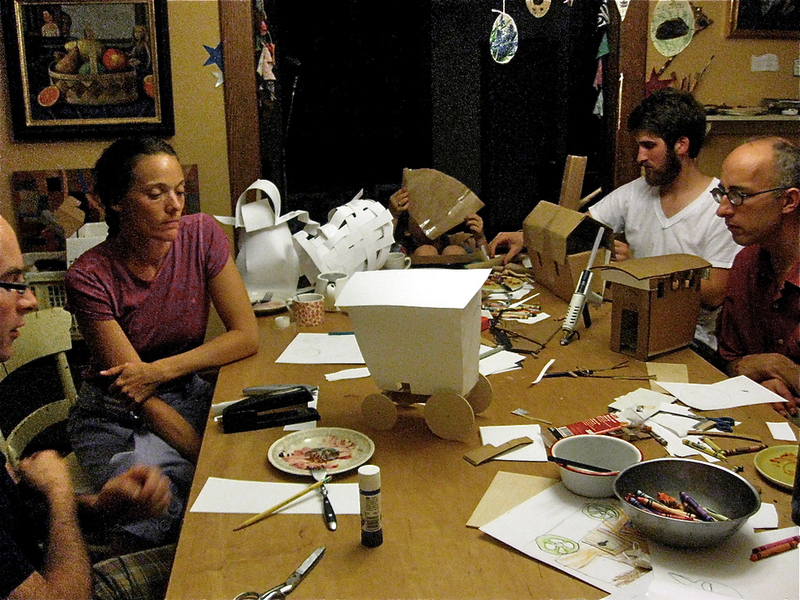 We had a couple evenings that were given over to drawing and constructing paper models that we that enabled us to go from idea stage to planing the actual design and construction of the wagon. Once we decided on the basic design we opted to go looking for an Amish buggy that we could separate from it's chassis in order to have the basic foundation to build the wagon up from. Putting the money up to purchase the buggy proved to be a turning point in the project that made the whole thing seem more real. 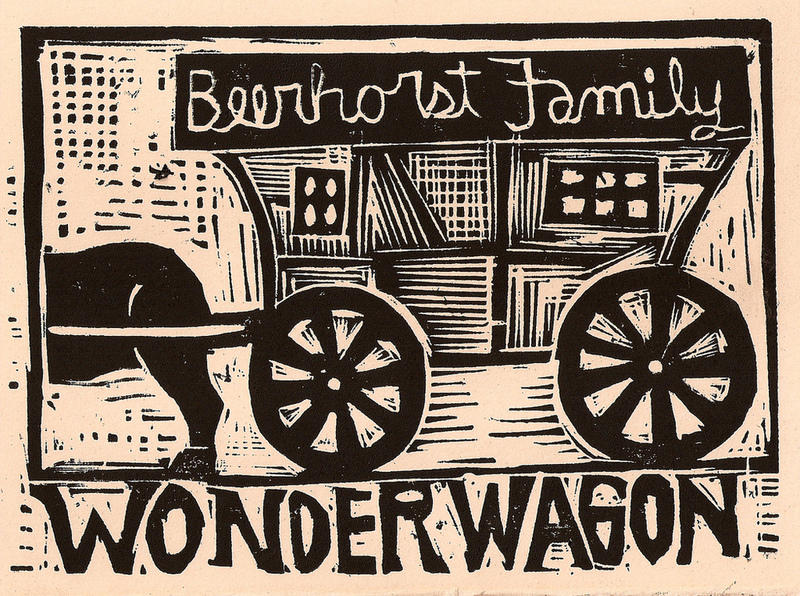 One of our basic objectives with the Wonder Wagon was to find a way to make public the artistic profile of not just Rick Beerhorst visual artist, but the Beerhorst Family as a dynamic force working together almost the way a circus family comes together to put on a show. This was a powerful comming out experience for our whole family of Eight to work together in a creative and very public way. There was one morning that a local TV news crew showed up at our home getting their satalite corridinates at 5:30 in the morning. Our son Shepherd ended up being in on the interview about 45 minutes later broadcast live from our driveway and he came across like an eleven year old pro. Since this was the first year that ArtPrize happened in our city no one really knew what to expect. We did understand that with this event we had a great opportunity to engage the public with what we had created so not only did we design and build the wagon to be placed with in a setting that would be fun and interactive. We filled the wagon with small art pieces that represented most of the family so when people came into this unique intimate space they could engage with art in a new way. We also put together a gypsy styled campsite that included tents were scheduled performers engaged the crowds. We also had specific workshops that we ran through out the two weeks were people could learn to make a wood block print our basic seweing skills. We were amazed to find so many people who had never even thread a needle. We learned a lot building the Wonder Wagon. One of the biggest lessons was learning to work together with other people. By collaborating with other art professionals and inviting enthusiastic volunteers to get envolved, we were able to go far beyond anything we would have been able to accomplish had we stayed with in our own pool of resources. As soon as we had recovered from the creation of the Wonder Wagon adventure we naturally began to consider where we might go next.